Part 1 Formulation: Chocolate manufacture; Formulation of chocolate for industrial applications; Fats for confectionery coatings and fillings; Compound coatings; Fat-based centres and fillings; Caramels, fondants and jellies as centres and fillings; Biscuits and bakery products; Chocolate and couvertures: Applications in ice cream. Part 2 Product design: Product design and shelf-life issues: Oil migration and bloom; Product design and shelf-life issues: Moisture and ethanol migration; Shelf-life prediction and testing; Controlling the rheology of chocolate and fillings; Using microscopy to understand the properties of confectionary products. Part 3 Processing, packaging and storage: Ingredient preparation: The science of tempering; Ingredient preparation: Tempering process technology; Manufacturing processes: Enrobing; Manufacturing processes: Chocolate panning and inclusions; Manufacturing processes: Production of chocolate shells; Manufacturing processes: Deposition of fillings. Enrobed and filled confectionery and bakery products, such as praline-style chocolates, confectionery bars and chocolate-coated biscuits and ice-creams, are popular with consumers. The coating and filling can negatively affect product quality and shelf-life, but with the correct product design and manufacturing technology, the characteristics of the end-product can be much improved. This book provides a comprehensive overview of quality issues affecting enrobed and filled products and strategies to enhance product quality. Part one reviews the formulation of coatings and fillings, with chapters on key topics such as chocolate manufacture, confectionery fats, compound coatings and fat and sugar-based fillings. Product design issues, such as oil, moisture and ethanol migration and chocolate and filling rheology are the focus of Part two. Shelf-life prediction and testing are also discussed. Part three then covers the latest ingredient preparation and manufacturing technology for optimum product quality. Chapters examine tempering, enrobing, chocolate panning, production of chocolate shells and deposition technology. 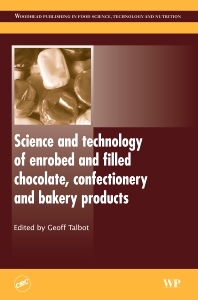 With its experienced team of authors, Science and technology of enrobed and filled chocolate, confectionery and bakery products is an essential purchase for professionals in the chocolate, confectionery and bakery industries.